“I Can Do Better!” Youth Soccer Referees Need Support – Not Harassment. 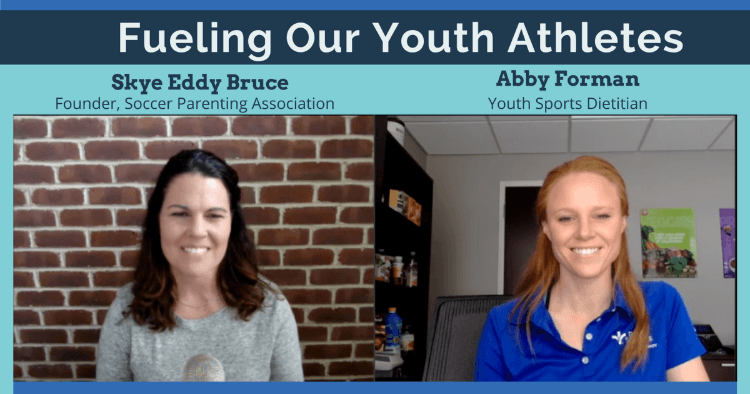 I knew I wanted to have Abby as a webinar guest when I watched her captivate the attention of over sixty 10-15 year old girls last month at the Girls Soccer Empowerment Day in Richmond, VA sponsored by Onyx Elite and Bon Secours Sports Performance. 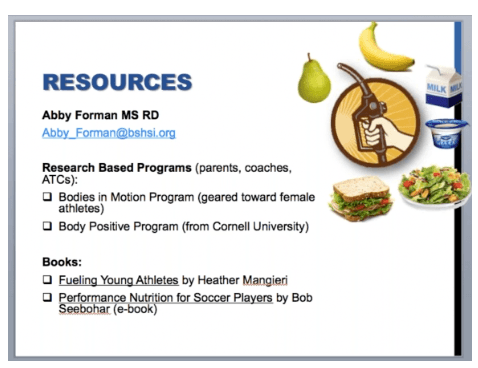 It was clear to me that she has an extraordinary grasp of the youth athlete combined with a grasp of the challenges we face as parents when it comes to helping our children make the best nutrition choices. 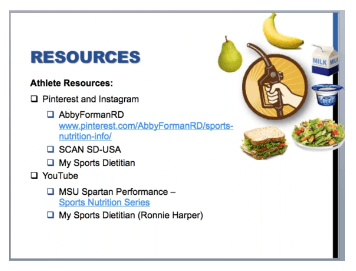 Abby began today’s webinar talking about the benefits of a balanced youth sports nutrition diet such as faster recovery times, enhanced focus and nutrition, not to mention improved performance! 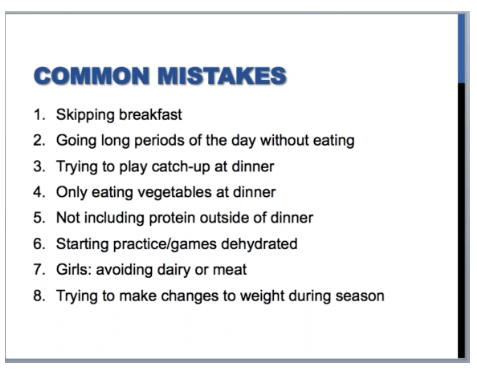 She then provided a pragmatic view of common mistakes that youth athletes make when it comes to nutrition. I really appreciated Abby’s focus on the female athlete. It was clear to me that she interacts regularly with young athletes as she was able to share experiences and anecdotes. Parents had A TON of questions! 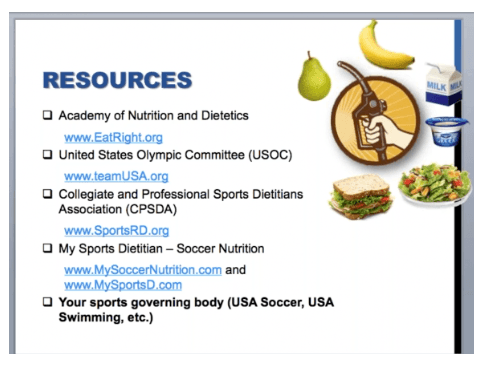 In fact, there were more questions asked in this webinar than any of our previous monthly webinars which highlights our desire as parents to do what we can to support our children in youth sports nutrition, not to mention our need to learn more about proper sports nutrition. There are a lot of demands placed on our children athletically and nutrition is a way we can really help! After diving into the macro and micro nutrient sources as well as suggestions for calorie intake, hydration issues and meal planning, Abby provided us with some important warning signs for Energy Deficiency Syndrome such as chronic fatigue, being slow to heal, a drop in performance, mood changes, and more. I had asked Abby to make her presentation as practical and useful as possible. I wanted parents to finish the webinar feeling like they had some additional resources for themselves and their children. With that in mind, Abby made the following suggestion for parental resources. And these were the sources, websites, social media accounts she suggested we tell our children about. The complete interview and much more information can be found at the SoccerParentResourceCenter.com. Founder, SoccerParenting.com Skye is a former All-American goalkeeper, professional player and collegiate coach. She holds her USSF “B” License and USSF National Goalkeeper License and is an active youth coach, soccer parent and coach educator.